JUST ADD YOU OWN RX/TX AND YOUR UP AND FLYING!!!! Specification: READY TO FLY WITHIN 45 MINUTES! 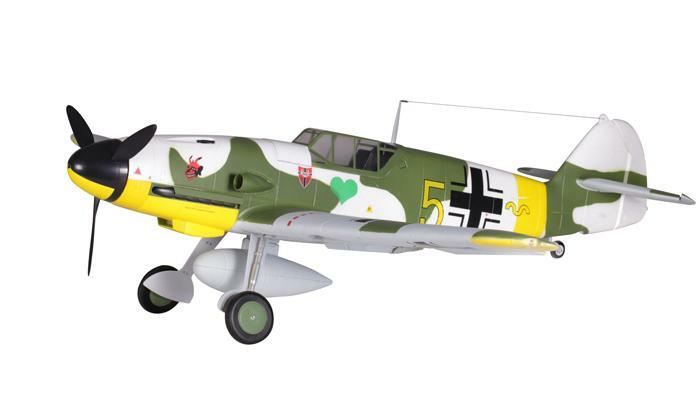 The BF 109 was the most produced fighter aircraft of WW2 and was powered by the Daimler Benz V12 producing over 1400hp. The aircraft was very cleverly designed to be very light and strong and FMS have been able to transfer this across to the 1400mm Series. Pilots using their own radio systems will need to adjust Travel Adjust and or EPA (End Point Adjustment) settings before operating.